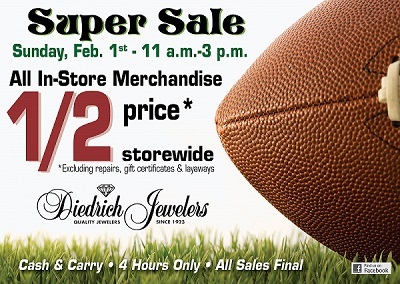 Save 50% off all in-store merchandise from 11:00 am-3:00 pm on Super Bowl Sunday! It's our most popular sale of the year for a reason. At no other time can you walk into the store and get 50% off everything in the cases or on the walls. Watches are included, clocks are included, giftware is included! Mark your calendars and set your alarms, and don't miss this awesome sale! See you on Sunday! *Angelica Collection bracelets can't be included in this sale per the manufacturer's agreement, sorry.